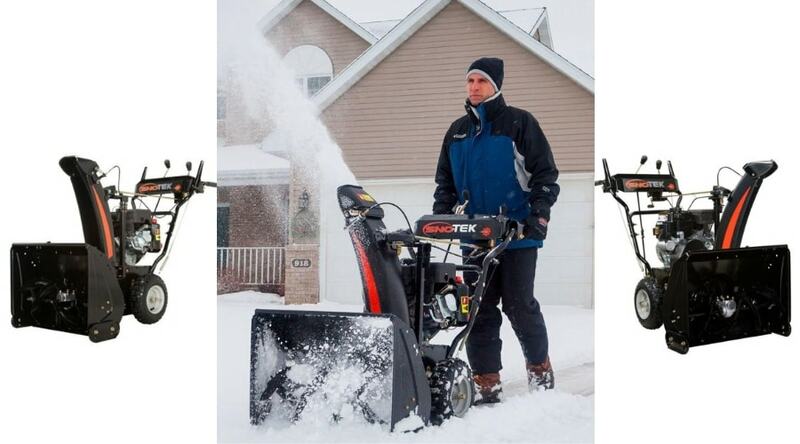 Built by Ariens, the Sno Tek Snow Blower is a powerful snow removal machine that you can depend on all winter long. 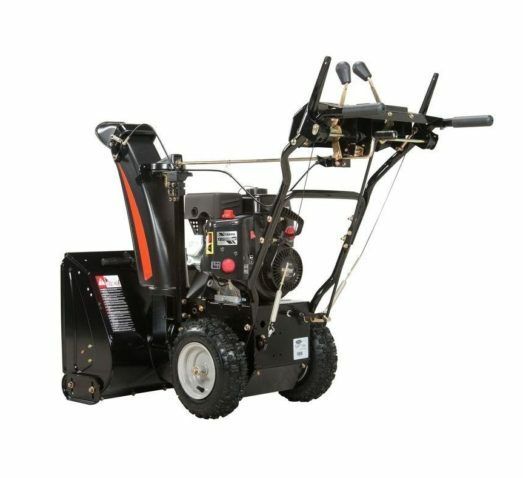 If you need a powerful machine to keep your driveway and walkway clear, this option is worth considering. When winter blows in the last thing you want to struggle with is the snowfall that often accompanies it. When you live in an area that receives its fair share of frozen precipitation, then you need a dependable product to keep your driveway clear- and your walkways safe. Without a dependable product, you run the risk, at best, of an inaccessible parking area; and at worst, a dangerous area to walk or drive in. 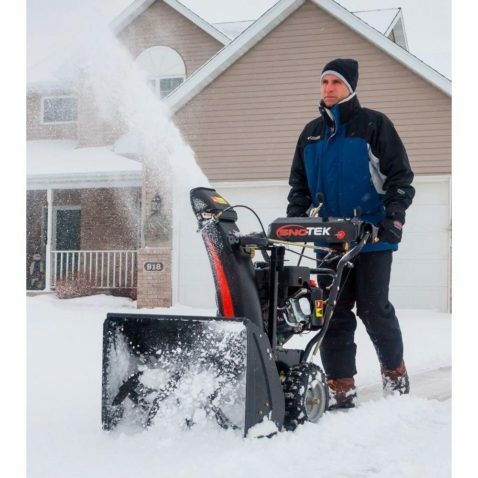 With a Sno Tek snow blower, designed and built by Ariens, you get a product that can get you through the worst of what Mother Nature has to throw at you. 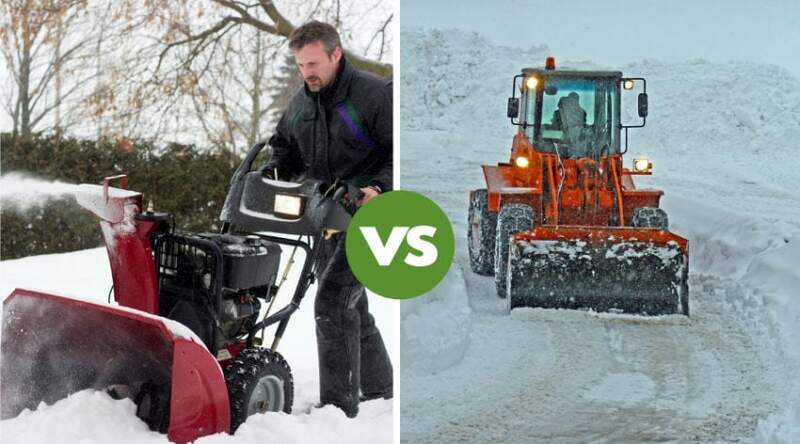 This Sno Tek snow blower review highlights what this machine can do, the power behind it, and why it’s worth considering for all your snow removal needs. Ariens was born in a backyard garage in 1933 with its first-yard maintenance product, a rototiller. By 1945 it was a worldwide recognized brand due to their help with the WWII war effort, and by 1960 had introduced their first snow blower. Today, their products are well known for their dependability, and their model designs are widely available for consumer use. 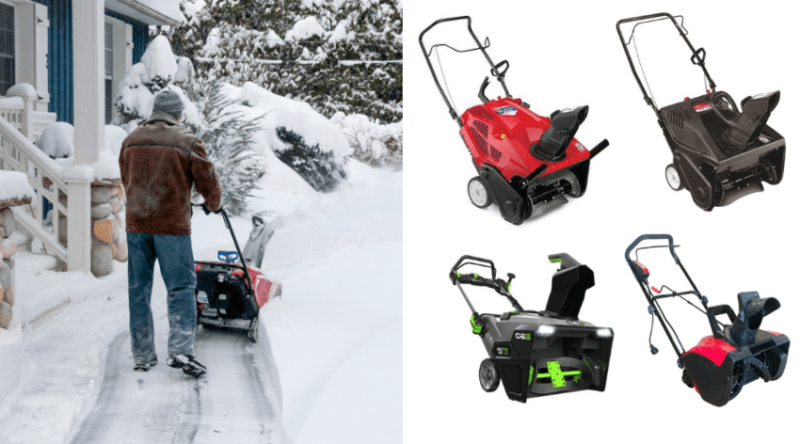 Their snow blowers in particular are considered some of the most powerful in the business, and their Sno Tek Model, made specifically for easy consumer sales, is no exception. 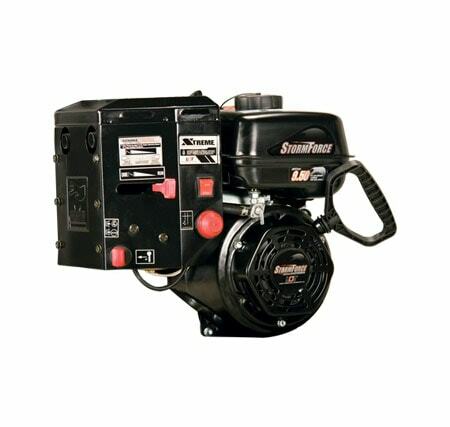 The following details provide a rundown of the Sno Tek Blower and all it entails. The general specifications of this product allow you to look overall it has to offer to decide if it is a good choice for you. 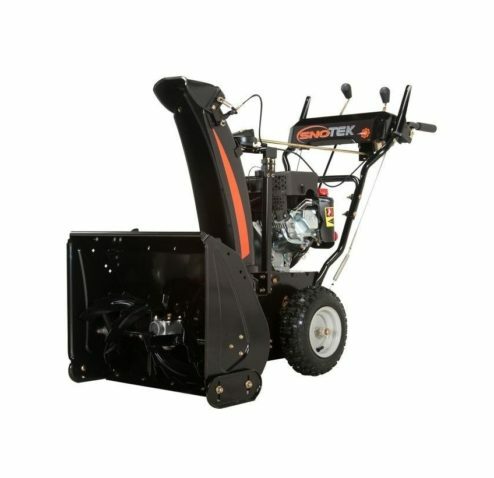 The Ariens Sno Tek model is a two stage blower, meaning it runs two augers to help chew through heavy snow and ice and toss it up to 40 feet away. 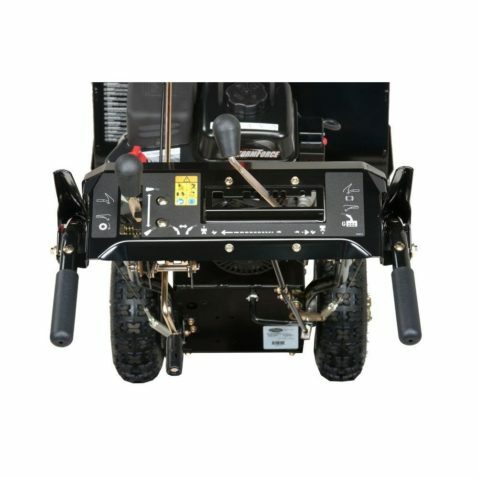 Two-stage designs are the most popular and varied snow blowers and are run by a gas engine to provide the energy needed to turn both augers effectively for some of the most efficient power available. It also boasts a top-load aluminum gear case for rust proof peace of mind, and to help keep your machine easier to maneuver and maintain. The alloy steel gears found within are durable and long lasting, and easy to maintain with proper use of synthetic gear oil. The engine of this model is designed and manufactured by Liquid Combustion Technology specifically for outdoor equipment power. Air cooled, it is designed to be reliably dependant for outdoor uses. Made especially for Ariens, this engine is a 4-cycle OHV model built to high-quality specifications to provide superior performance through the toughest of winter conditions. Dubbed the ‘SnowForce’, this 208cc engine has the power needed for consistent snow clearance jobs. To help save your arm, a 120 Volt electric start comes standard with this model. This provides a simple push start power to help get you to work quickly without having to worry about pulling a cord over and over. All that needs to be done is to plug your blower into a standard household electrical outlet when not in use to keep your push start charged and ready to go. The impeller of a blower is an important part of the overall function of the machine. It is the auger that works to lift the snow and throw it. This particular impeller is a full 12 inches in length with 3 blades to help lift the snow and ice to toss it through the chute. As snow works through the machine it can often catch on bits of ice that may have frozen to the impeller due to snow melting when stored and refreezing. 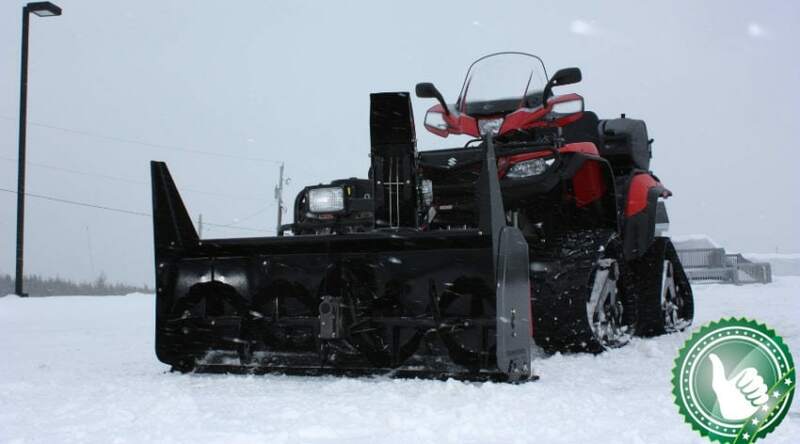 But this particular blade is considered freeze resistant, meaning it also snow and ice to slide easily off it to keep the impeller free and clear form any sort of snow buildup and jamming. The initial auger is the one that runs the length of the blower housing. This auger is the one that chops into snow and ice to help drive the machine forward and move snow through the machine to be taken up by the impeller. Steel is a tough and durable metal that doesn’t rust or wear easily, and the serrated edges work as teeth to help chew through packed snow and ice left behind by changes in the weather and plows. With 6 forward gears and 2 for reverse, smooth transitions are driven by a Disc-O-Matic drive system to provide you with easy shifting and seamless positioning. A drive train allows you the opportunity to keep a machine of this size moving even through deep, heavy snow with very little physical effort, and helps you back it up and turn it to where it needs to be. The interlocking control levers allow you to steer with one hand as well. This frees up a hand to adjust the chute, or change gears without having to pause in your work. The 205-degree rotation chute can be adjusted to toss snow 3 feet to 40 feet and can be moved to ensure you get the snow to where you need it. This also helps you avoid blowing snow where it is not wanted, or piled up all in one place. This chute is easy to control from the handles with a simple turn of a lever, allowing you to continue working without having to manually move the chute. The full 2 foot wide and 20-inch high housing is plenty large to handle high snow banks and clear both walkways and driveways with a minimum of passes. 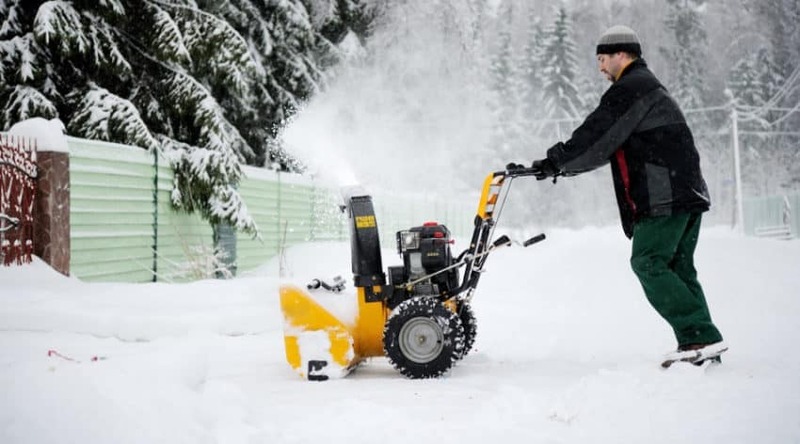 Capable of moving large amounts of snow at a time, this is a popular size for residential homeowners who need regular clearing of medium to heavy snowfalls from common parking and walking areas. It also is built to allow you easy clearance on gravel driveways to avoid picking up rocks or dirt as you work. 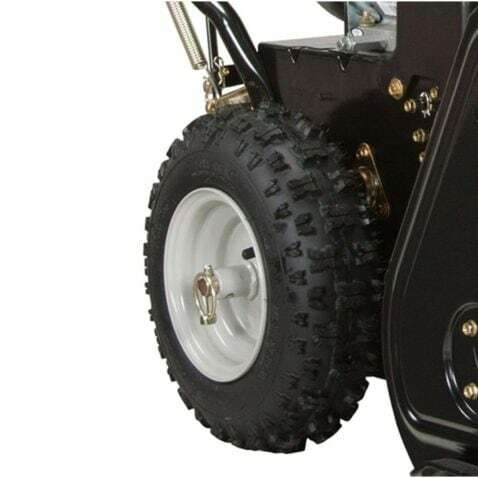 The large, threaded Polar Trac tires are pneumatic in nature and easy to air up if the occasion arises. These have aggressive treads to help provide traction in slick conditions and to grip in the snow to help drive your machine forward. At 13” tall with a 4” wide wheel, you can be certain that you get through even the toughest of winter storms. 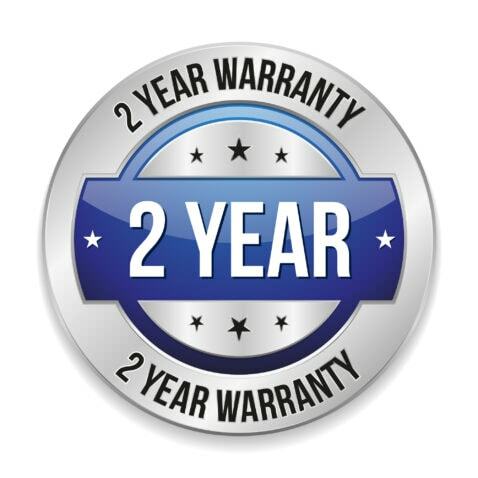 The Sno Tek model comes with a full 2 year limited warranty with the registration of the product upon purchase. This ensures that the product is free from defects in material and workmanship. An authorized dealer can either repair or replace any parts that are found to be defective. Although some limitations do apply, most issues can be serviced unless obviously created through improper use. The engine does come with its own warranty as well and is serviced through the engine manufacturer. 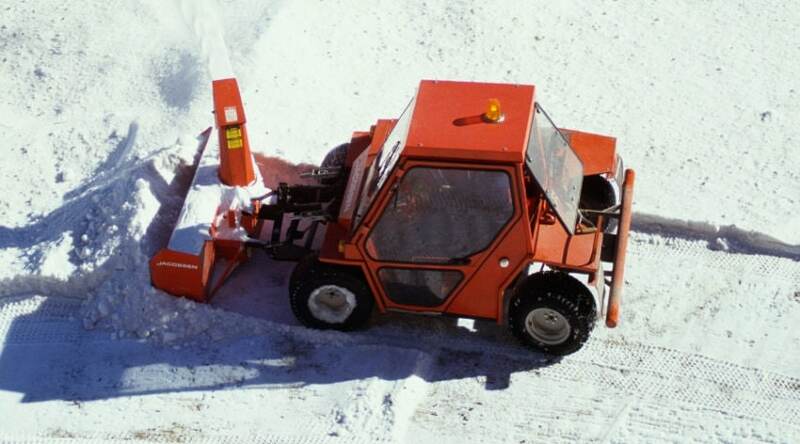 Consumers are happy with the power of the machine and note that it can handle heavy, wet snow with ease, and is an excellent option for the value. It also does not seem to get clogged up and does come with customer service that is easy to contact. No complaints about a machine that won’t start are mentioned either, with easy to handle and use levers and gears. As a machine built for residential use, it seems to run seamlessly and is easy to maneuver. Complaints seem to cover defective parts and workmanship, which is covered by warranty and does not seem to be reflective of the use of the machine itself. 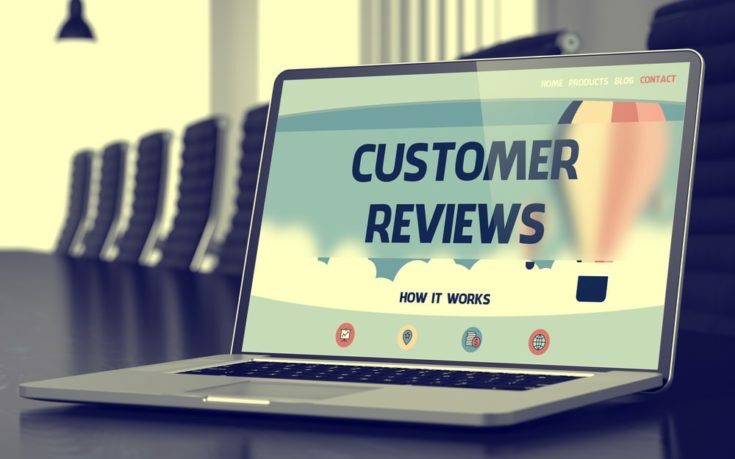 One customer even commented how impressed they were with service when they damaged the blower with a rock, and in looking for the repair part – was able to have it done through the authorized dealer with no problems. 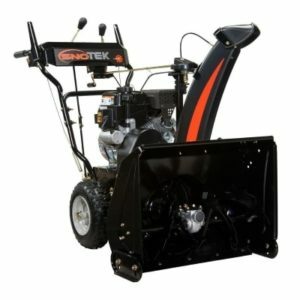 If a snowblower is on your list of needs to help keep your driveways and walkways clear of snow, Ariens Sno Tek Snow Blower is definitely worth taking a closer look at. Large augers that can toss snow up to 40 feet, and a dependable drive train to keep your machine moving through winter conditions, makes this a product you can depend on. Plus, it comes with a healthy warranty and excellent customer service through authorized dealers. If you have any further questions about this machine or have any experience with one, we’d love to hear from you below. And, as always, please share!